Jill, you are my hero! I started the plank routine today and didn't do 5 sets... as a matter of fact, I didn't even finish 2 sets! Then I pretty much collapsed on the floor. 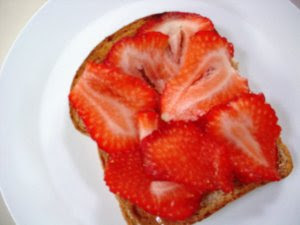 Thanks to Vanessa and Julia for the suggestions about my strawberries... For breakfast today I talked The Captain into having fresh berries on his toast and PB instead of jam. And I had mine with Nutella and strawberries and got so excited about eating it that I forgot to take a picture! 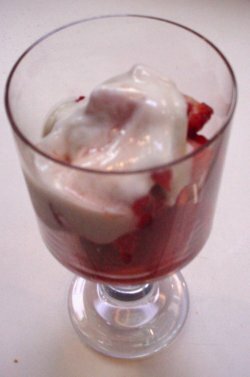 And that spurred my memory to look up a recipe that a buddy of mine gave me a couple of years ago, where you marinate strawberries in a mixture of balsamic vinegar, black pepper, and brown sugar... then top with vanilla yogurt. We had this for dessert tonight... mmmmm. And then I remembered that last year we grilled strawberries on the BBQ and they were wonderful too. Particularly tasty with grilled pork tenderloin. I think I will get The Captain to buy some more tomorrow while I am at my Weight Watchers meeting. A late afternoon walk to the library to pick up the last 2 issues of Runners World, about 40 minutes, topped off the afternoon. I think my abs are more sore than they have ever been. Ahhh! i went to an abs class last week and we did SO many planks. I was sore for 3 days! I could not believe it! haha! You are amazing for doing all those planks! Thanks for the shout out :) I am loving all of the strawberry ideas...grilled strawberries sounds soooo yummy! Thanks. I guess the things I find the hardest are a good indicator of where I need the most effort. You always inspire me when I read about your workouts. I keep hearing about this plank challenge, I am intrigued and will have to check it out. 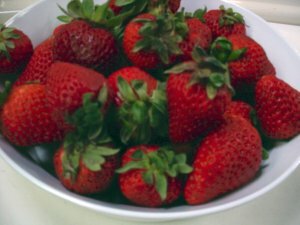 I am getting very hungry for strawberries, that all sounds so good!